Robben Island has been used to isolate certain people since the end of the 17th century. It is an island in Table Bay, 12 km off the coast from Cape Town. The name is Dutch for "island of seals". Robben Island is roughly oval and about a kilometer wide. It is flat and only a few metres above sealevel. 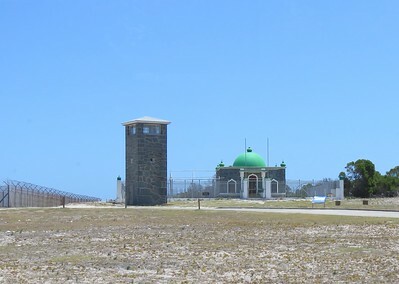 From 1836 to 1931 the island was used as a leper colony and in the 20th century it became infamous as a gaol for political prisoners under apartheid. Notable amongst these were Nelson Mandela, Walter Sisulu, Tokyo Sexwale, Govan Mbeki, Dennis Brutus and Robert Sobukwe. During the time that the island was a prison, security was very tight and it was off limits to almost all civilians, including fishermen. 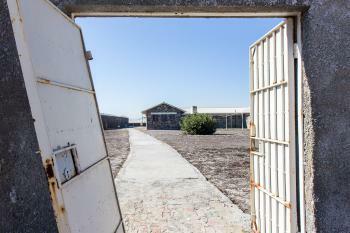 Robben Island was the penitentiary island where the South African apartheid regime kept its political prisoners between 1962 and 1991. Almost all of the past and current elite of the ANC was imprisoned here, but the cells also held members from the more radical Pan Africanist Congress and the Namibian independence movement SWAPO. The island, which lies in viewing distance from Cape Town, has been in use since the times of the Dutch East India Company (mid-17th century). One nowadays can only visit Robben Island on a tightly organized tour. Beforehand I had heard and read a lot about those tours: not a minute of free time to walk around for yourself, unintelligible guides who tell muddled stories, even ferries that get into trouble on the short crossing (60 people had to be rescued from sea in September 2017). But my experience was entirely different: maybe they have taken improvement measures or I caught them on a good day, but the staff on the ferry was very polite, engaging and safety conscious. The personal story of the former prisoner that acted as our guide I found very moving and added value beyond just looking at a bunch of stone prison buildings. The boat tours depart four times a day from the most touristic part of the port of Cape Town. There, between the expensive restaurants and shops of the V&A Waterfront, lies the ‘Nelson Mandela Gateway to Robben Island’. It is an exhibition space (unfortunately closed when I visited), souvenir shop and mooring for ferries. In the store they really sell everything with the image of Mandela on it, even packets of rooibos tea. The ferry ride takes only half an hour, and from the top deck (be early on board to secure a place there!) you have formidable views of Cape Town with the Table Mountains as its backdrop. We also saw two whales on our way across. Robben Island quickly came into view. I had expected it to be a fairly barren island, but it has a village of considerable size (where the staff of the museum lives), lots of greenery and many former prison buildings. On arrival we were immediately divided over about five buses, each of which continued on its own route across the island. 'My' bus first went to the prison buildings. The special feature of Robben Island Museum is that former political prisoners who have been detained here have been hired to give the tours. They now live here again on Robben Island, but with their families. Our guide had been living in Johannesburg but could not find work, so he was happy that he had found a job here. I wonder if over the years they’ve filtered out the ones that did not fit the guiding requirements well, as public speaking isn’t for everyone. Our guide delivered a good and personal story about how he came here and what he did in the 8 years he was imprisoned there (he worked in the kitchen). The only other prisoner who is mentioned over and over here is Nelson Mandela - he already had a special status at that time. Many of the other government leaders of the past 20 years, including the current president Jacob Zuma, have also been detained here. Zuma distinguished himself especially as a football referee. The regime was heavy in the 1960s and 1970s, with little food and ill-treatment. Later on, due to outside pressure the conditions improved and the prison developed into a kind of university for the ANC leadership. After the prison visit, we were directed back to the bus for a tour of the island. This goes very fast - if you are on the wrong side of the bus to take pictures, you are unlucky (sit on the right!). We see, among other things, the leper cemetery, the village buildings of the former guards, the tomb of a muslim holy man detained by the Dutch East India Company (Moturu Kramat) and the stone quarry where some of the prisoners worked. At the far end of the island we were allowed a break to stretch our legs, buy some drinks at a kiosk or watch penguins. The full tour including ferry crossing eventually took 3.5 hours. Overall I am not happy with the selection of South African WHS, and Robben Island ranks amongst the worst. It is worse than visiting Alcatraz by miles so if you enjoyed there then you don't miss anything here. For some reason it is one of the most popular attraction Cape Town has to offer as if everyone is obligated to see it, with a whole bunch of your groups from all ages. It may just be on my day but aside from one school tour the tourists were 97% European Whites so I guess they dig that place. No Chinese groups, one single guest from Nigeria, and I wouldn't go as far as calling the other guests “Eurotrash” but it seems their idea of Africa is Cape Town alone and it was very fitting with the crowd that hangs around the waterfront and shops at the mall and sits in the overpriced restaurants rather than see the rest of the country. Anyhow so the tour starts with a long line to get into the boat. A hefty price tag (380 Rand or something) gives you a nice seat on a catamaran and we were also lucky to see humpback whales on the way. The ride was roughly 40min with a safety video, ads, a coffee shop onboard and nice views of the bay. Upon arrival you get shuffled into a bus that takes another 45min, 15 of which are another rest stop with a small shop, a view of the bay again, 6 penguins and some oystercatchers. Whereas I found the guide entertaining and the facts about the island interesting, most is not about the prison. 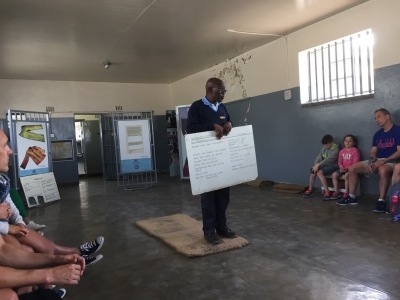 When we finally got to the prison (some buses start there first and do the village and quarry tour afterwards), you see the cell of Nelson Mandela, identical to all other cells, listen to a talk in the heat of the yard and then get to sit in a bigger shared cell for more rehearsed stories about prison life. The guards are former inmates and I'm happy they got a job here, but he surely doesn't earn a tip for the boring lecture. I think half of the people fell asleep. I listened to another guide on the way out of the max security facility and I think your experience will largely depends on your guide for this part. Getting back on the boat was really annoying with everyone trying to cram into the small ticket booth to scan your ticket and avoiding the sun outside. Just shows me that everyone is glad to be back to leave as fast as possible, even though the boat doesn't leave until everyone is on board anyway. Later on when I took a taxi ride to my apartment I told the driver how disappointing the tour was and he said he never went there, it is only for tourists - well, I was a tourist for a day but would not go if it is not a world heritage site. Basically I find the impact to the world a little limited but I guess nobody could have denied a place Mandela was incarcerated for so long. I did not ask the "guide" why he thinks the place is worthy of a UNESCO title, I doubt he can answer that question, the entire staff was rather lacking and interested in their job aside from the bus tour commentator (but I'm not interested in finding out where other guests are from and that he can greet them in their language - this is a waste of time on any tour). I visited this WHS in March 2018. It started with a very pleasant and beautiful 50 minuts boattrip from V&A Waterfront, then in a bus with a guide (who actually was living on the island with his family) around the island to the prison where Nelson Mandela had been kept for 18 years. Our guide here was also a former ANC prisoner - and it was very interesting but also very sad to hear him speak about his time in jail. At the end of the tour we saw Mandelas prison cell. The whole island is a museum now - a very interesting WHS and it is very important that we don't forget the history. What a disappointing experience. I was really looking forward to visiting Robben Island because of the important part in history it plays - not just in South Africa but across the world. I had heard the tours were taken by former political prisoners and so was expecting to hear a lot of interesting information. Unfortunately the problem lies not with the tour guide or the state of the island but with the tour organisers themselves. This is the only way you can visit the island - with the one tour company - and they do not provide a rewarding experience. The first half of the tour is on a bus and you have to peer out the window as they point out different buildings. The information is quite good but you could have read that in a book. I would have preferred to have been walking around and seeing it for myself and getting a sense of the place. The second half of the tour is inside the jail but you are still in a large group. You get ushered through from room to room and it can sometimes be hard to hear the guide, or he'll start before the last people have come in. Again, all I really wanted was to walk around myself and see the place. This kind of tour might suit some people but it's a pity there isn't an option to do it another way. I think all the emotion and meaning of the island is lost. As an addition to the former reviews I can add, that the visit was not fully satisfying to me. During the whole visit you basically have no time to explore on your own. The mandatory bus tour to see the island starts right after you get off the boat. We could leave the bus 2 times: once at the quarry and once for 15mins on the southern point of the island at a snack bar. I literally ran back to the village we briefly crossed before by bus in order to make a few pictures, before the bus was departing again. When inside the bus, we spend most of the time standing in front of a building, while the guide explained this and that. The prison visit was not better. We spent around 40 of the 45min visit in the same room, where the ex-prisoner talked about live in the prison. We briefly translated to the yard, where he talked for a few more minutes and told us that we will pass the former cell of Nelson Mandela on our way out. When the tour ended we already had to hurry back to the boat, as you don’t get to choose at what time you can go back. It’s a group travel experience that does not fit my usual travel style. I first visited Robben Island in 1994 and was impressed. 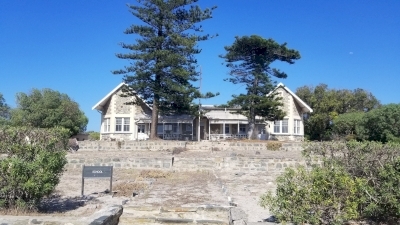 However, re-visiting it last year (2008) I was bitterly disappointed with the amount of neglect and dereliction that had been allowed to occur there. Certainly the prison has been well-looked after and restored, but the rest of the island verges on the appalling. The guide we had on our tour did nothing but rattle on in her own dreadful version of Afro-glish about Robert Sobukhwe (about whom most of the foreigners on the bus knew nothing) and scarcely made mention of Mandela. We were taken to a rubbish dump from which there was a good view of Cape Town and told that we could take pictures. However, the fortifications and the penguins were utterly lacking from the itinerary and were never mentioned. It struck me that it was an awful pity that such an interesting place had been allowed to reach such a state of dereliction and scabbiness. The site consists of two locations - the Nelson Mandela Gateway (+ Jetty 1) which is on mainland. There is a museum and and a port. In the museum there is a small cinema where former prisoners are speaking and singing - it is very emotive. The boat trip to island takes about 30 minutes. If you step out on island you will see the main gate with sign "Robben island welcomes you - we serve with pride". Then you are taken by a bus trip around the island where you can see the village, school, temples, prison for criminals, some shipwrecks, lighthouse and a cannon battery. The guide in a bus was a very funny guy who at least made some humour in this sad place. We visited also the "University of Robben island". It is a small cave in lime quarry where the political prisoners were teaching one another. When the guardsmen caught them, they were punnished. Next part was a visit of Maximum security jail - thats the part where the political prisoners were held. Ironic is the jail was built by the prisoners itself. All the sectors A-F are ground floor buildings. A-F were cells for one prisoner, D-F were big rooms for 80 prisoners. None of the sector was comfortable. Each guide here is a real polictical prisoner, so you get the info from first hand and its best for you in order to ask a lot of questions. The place is not a beauty site - but you can feel all the bad what happened there - I had a lot of to think about when we finished. If I do recommend this site? - yes, for sure. As a bonus: on the island is the second greatest African penguins colony in SAR. In this section from his memoirs, Mandela describes the harsh daily routine during the early years on Robben Island. Lighthouses: A small lighthouse on Minto Hill in the southern part of the island (1864). Offshore of a major city: Situated in Table Bay/Atlantic Ocean 12 kms off Capetown. Ferry from Nelson Mandela Gateway at the V&A Waterfront. VOC: Via the Dutch East India Company "In 1652 Jan Van Riebeeck, working for the Dutch East India Company, saw in the island an important refueling site on the trading route between Western Europe and India. Sailors began to stop on the island in order hunt seals for fresh meat and to trade with locals for cattle and sheep. This refreshment of supplies was important in order to avoid such deadly diseases as scurvy and dysentery. Throughout the 1650?s and 60?s the island became more and more popular. Dutch sailors began to colonize the island, mining stone for buildings and lighting warning fires at night in order to keep boats from running ashore on the islands rocky coast. settlers. " Until 1795. 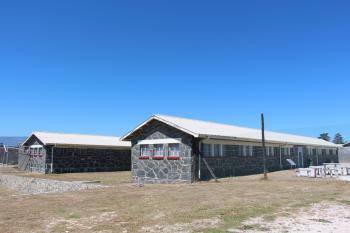 Built in the 17th century: Since the end of the 17th century, Robben Island has been used to isolate certain people. Built or owned by Dutch: Via the Dutch East India Company "In 1652 Jan Van Riebeeck, working for the Dutch East India Company, saw in the island an important refueling site on the trading route between Western Europe and India. Sailors began to stop on the island in order hunt seals for fresh meat and to trade with locals for cattle and sheep. This refreshment of supplies was important in order to avoid such deadly diseases as scurvy and dysentery. Throughout the 1650's and 60's the island became more and more popular. Dutch sailors began to colonize the island, mining stone for buildings and lighting warning fires at night in order to keep boats from running ashore on the islands rocky coast. settlers. " Until 1795. Viewable from another WHS: Can easily be seen from Cape Peninsular NP facing North (e.g from the top of Table Mountain or Signal Hill) within the Cape Floral Region.